Studios around the world count on Focal monitors to deliver the sound of their mixes with exceptional accuracy and detail — and can you, too, with Focal's latest Alpha series studio monitors. 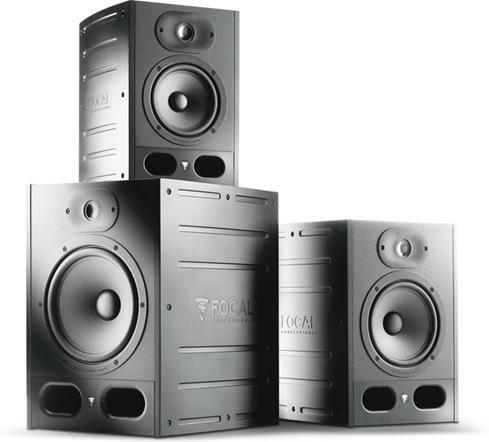 Focal builds these powered monitors to exacting standards using exclusive technologies and a high level of craftsmanship. Alpha series monitors are engineered from the ground up to bring superior sound into a wide variety of studio settings for top-notch results every time. Focal's family of Alpha monitors come in three sizes for accurate, detailed sound that's a perfect match to your studio. The Alpha monitor's powerful bi-amped design features separate amplifiers for the tweeter and woofer to deliver high output levels with vanishingly low distortion. 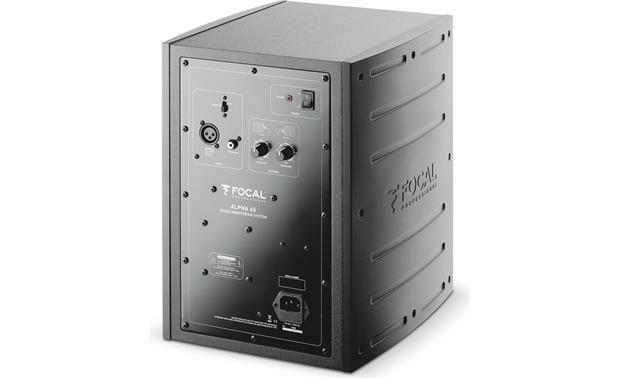 Dual front-firing ports extend low-frequency response while reducing boundary coupling, an effect that can cause overemphasis of certain bass frequencies when the monitor is placed near a wall or corner. The included rubber pads provide vibration isolation between the speaker and your desktop or console for even greater sonic accuracy. The Alpha 65 utilizes Focal's signature 1" inverted aluminum dome tweeter. Inverting the dome optimizes the physical connection between the voice coil and the dome, maximizing efficiency and precision. The speaker's tight, responsive bass and transparent midrange come courtesy of Focal's 6-1/2" Polyglass woofer. This driver is created by depositing a layer of hollow silica glass microbeads over a layer of cellulose pulp. This unique material combines the smooth sound of cellulose fiber with the incredible strength of glass, for a stiff-yet-lightweight cone that responds rapidly with extremely low resonance for precise, neutral sound over the entire bass/high-midrange frequency spectrum. Focal knows you don't always have control over the space you're working in, so they gave each Alpha series monitor fine-tuning capabilities to help you match its sound to your environment. The high-frequency level adjustment knob allows you to tailor the tweeter's output to suit your sonic preference. The low-frequency control lets you boost or cut bass to compensate for room acoustics, room size, and monitor position to maintain proper frequency response. To keep you connected to a wide range of studio gear, each Alpha monitor features an unbalanced RCA connector and a balanced XLR connector. And since both inputs are always active, you can have two sources plugged in and ready to play at any time. These monitors are absolutely amazing. Highs, midrange and bass are all perfect for my listening needs. They make excellent near field computer speakers when paired up with a nice DAC. 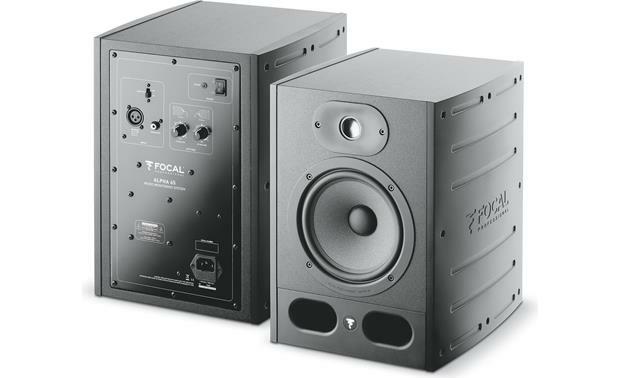 Active Studio Monitor Speaker: The Focal 65 is an active two-way near field professional monitoring loudspeaker. This powered studio monitor speaker performs just as well with instrumental music as with electronic music, and is characterized by its great versatility. 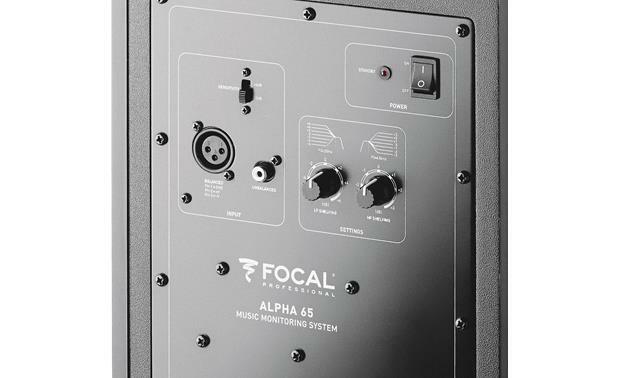 Two-Way Speaker Design: The Focal Alpha 65 studio monitor powered speaker utilizes a two-way speaker design with one 1" aluminum inverted-dome tweeter and one 6.5" polyglass woofer for a frequency response of 40Hz to 22kHz (+/- 3dB). 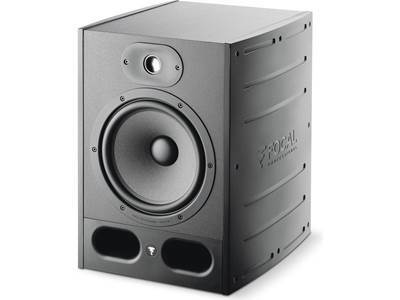 Bi-Amplification: The Focal Alpha 65 studio monitor speaker is powered by two built-in class-AB amplifiers. A 35-watt amplifier is used for the tweeter, while a 70-watt amplifier drives the woofer. The amplifier design offers identical tonal balance at low and high volumes. Bass Reflex Enclosure: The Focal 65 features a bass reflex cabinet with two front-firing ports for greater efficiency and bigger bass. The cabinet is rigid and well damped to prevent unwanted distortion caused by vibration. 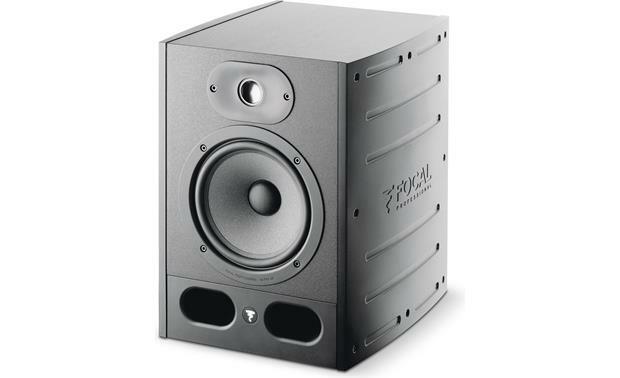 XLR & RCA Inputs: The Alpha 65 studio monitor powered speaker is fitted with both XLR & RCA inputs. There is a single balanced XLR (10kΩ) connector and one unbalanced RCA (10kΩ) connector. Up to two audio sources can be connected to speaker at one time. HF Shelving: The HF Shelving potentiometer permits to activate or not a correction of the sound level from 4.5kHz. We advise you to set it on +2dB when the premises acoustics naturally softens this frequency range (mat environment). When the premises acoustics is neutral, 0dB setting is recommended. -2 or -3dB are recommended when the premises acoustics naturally increases this frequency range (bright environment). Low Shelving: The LF Shelving potentiometer permits to activate or not a correction of the sound level under 300Hz. We advise you to set the LF Shelving potentiometer on +2dB when the premises acoustics naturally soften that frequency range. We advise you to set the LF Shelving potentiometer on 0 when the premises acoustics is neutral. We advise you to set the LF Shelving potentiometer on -2, -4, or -6dB when the loudspeakers are placed next to a wall or an angle. 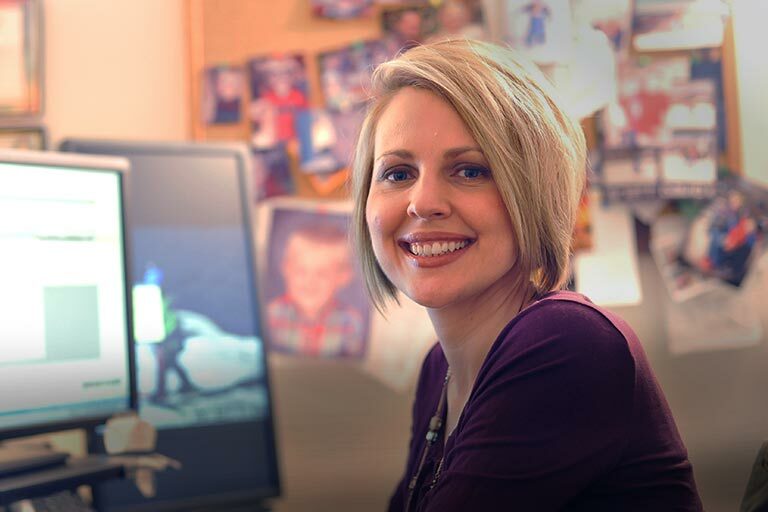 Sensitivity Switch: This switch function is to allow more SPL from the monitor if necessary. The available sensitivities are 0dB and +6dB. We recommend you to set the sensitivity on 0dB. The +6dB is an interesting solution when you want more SPL whereas your audio source is already reaching its output limit. Automatic Standby Mode: The Focal Alpha 65 goes into Standby Mode after approximately 30 minutes of no signal. Once the speaker senses an audio signal, it will turn back on automatically. 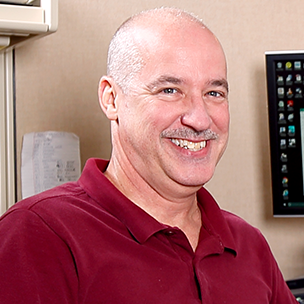 composed of the two monitors and your listening position. I want to hook up a subwoofer with these, how do I do that?